P.W. 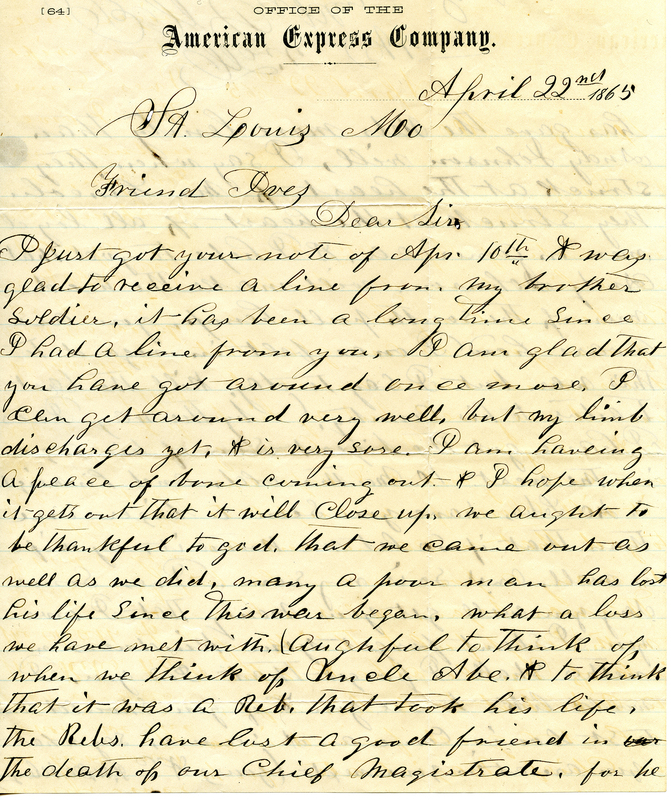 Oakley of St. Louis, Missouri, wrote this letter to Norman Henry Ives in Nashville, Tennessee, on April 22, 1865, a week after John Wilkes Booth assassinated President Abraham Lincoln. Oakley and Ives shared the bond of having been injured during the Civil War--Ives, a native of Illinois, had been discharged from the U.S. Army after suffering a leg wound at the Battle of Pea Ridge in 1862. Oakley begins the letter by discussing his injury. He then turns to his thoughts about the assassination of Lincoln, referring to the slain president as "Uncle Abe." Oakley suggests that Lincoln would have shown more lenience to Confederates than his successor, Andrew Johnson, would (speculation that would prove untrue). He also expresses hope that Confederate leadership would "pull hemp"--be hanged--for the assassination. Oakley then goes on to brag about the size of his 10-month-old son. Ives kept this letter and eventually passed it down through his family. His great-great-granddaughter Arlis Groves, a social science teacher at Toby Johnson Middle School in Elk Grove, California, now holds this letter and contributed it to Remembering Lincoln. I just got your note of Apr. 10th. I was glad to receive a line from my brother soldier. It has been a long time since I had a line from you. I am glad that you have got around once more. I can get around very well, but my limb discharges yet. It is very sore. I am haveing a peace of bone coming out, & I hope when it gets out that it will close up. We aught to be thankful to god that we came out as well as we did, many a poor man has lost his life since this war began. What a loss we have met with. (Aughful to think of, when we think of Uncle Abe. & to think that it was a Reb. that took his life. The Rebs. have lost a good friend in the death of our Chief Magistrate, for he has gave the Rebs more lenity than Andy Johnson will. I say when they struck at the heart of Mr. Lincoln they struck at the heart of all loyal men in America, & I hope to god that Andy Johnson will make the head men of the south pull hemp. You are aware how I once felt in regard to this war. But, I say today, kill the last traitor to his country. By the way, Ives, I have got the bigist son of his age in the west. 10 months old and his weight is 40 lbs. Have you seen a biger one than that? If so, let me know it. My wife is well. And so is my son. Ives, some day you will get your money that I owe you. I shant forget your kindness nor nether shall I forget that I ow you. I would like to see you & if you should come to St Louis, come and see me. Say what you are at in your next. This item is in the public domain and may be reproduced and used for any purpose, including research, teaching , private study, publication, broadcast or commercial use, with proper citation and attribution.